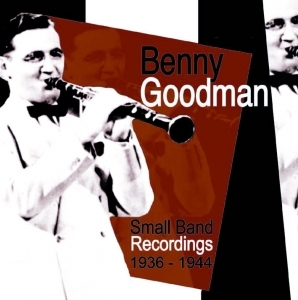 Benny Goodman was born in Chicago, Illinois on May 30th 1909, to a poor immigrant Jewish couple from Eastern Europe. He had music lessons at his local synagogue and boys club, and listened to New Orleans jazz clarinettists who were in Chicago, like Jimmy Noone and Johnny Dodds. He soon began playing in bands, joining Ben Pollack when he was just 16, amd making his first records the following year. He moved with Pollack to new York in the late '20s, and made many records as a session player alongside other soon-to-be-illustrious names Miller, Dorsey and Venuti among them. Under the guidance of John Hammond he made records for Columbia, once again with the emerging elite of the era. He got his radio break with Let's Dance, a network show that established his name on the West Coast, although his new upbeat hot music did not go down well with NY audiences and by 1935 he was nearly out of business. However, a tour took him to California, where, during a legendary 3-week season, the hot swing arrangements done for him by Fletcher Henderson, had audiences raving, to the extent that the performances were later heralded as the birth of the swing era. Seasons in Chicago, with associated radio broadcasts, cemented his arrival, followed by the famous CBS Camel Caravan radio series from Hollywood. His 1937 concert at Carnegie Hall is regarded as one of the most important in the annals of jazz, marking the acceptance of the genre by mass market white audiences. Goodman continued to record with both big and small band line-ups playing with a variety of musicians. He was legendarily dismissive of racial segregation laws and worked, even in the south, with the likes of Teddy Wilson, Gene Krupa, and Charlie Christian in defiance of the Jim Crowe laws. He flirted with bebop and cool jazz as the '40s progressed, but always reverted to swing, as well as increasingly exploring his interest in classical music, and even collaborating with George Benson in the '70s. He continued playing until his death from a heart attack in 1986 aged 77. His influence was enormous, and along with other bandleader contemporaries, helped establish among a wider audience. Acrobat has two collections of his work on catalogue - for details click here.